Dressed in the standard khaki cargo pants and green polo shirts, the members of the 266th Session of the FBI National Academy walked among walls of the National Law Enforcement Officers Memorial on Wednesday night. As the sun started to set, they kneeled by the 20,789 names. Some sat nearby in silence, others etched names they recognized onto paper. The officers looked across E Street at the wide 30-foot hole in the ground, part of the construction that will eventually become the National Law Enforcement Museum. They talk about making a trip back to Washington, DC, in mid-2018, when the Museum is slated to open. The FBI’s Jeffery S. McCormick started the wreathlaying ceremony with the introduction, welcoming the 266th Session to the Memorial. The presentation of colors was provided by the Alexandria (VA) Police Department. Memorial Fund President and CEO Craig W. Floyd was happy to have the members of the National Academy at the Memorial this week. Mr. Floyd took a few minutes to share the history of the Memorial, how it was built and the special significance of Judiciary Square, where the Memorial, and soon the Museum, stands. “It was in 1972 when a detective from Suffolk County in New York, by the name of Donald Guilford, had the vision to build a national law enforcement officers memorial. And he took that to his local Congressman, and they introduced a bill. Language for some time, but ultimately they went to a leader among law enforcement. His name was Mario Biaggi, a Congressman from New York City. He had served for 23 years with the New York City Police Department. A legendary figure, he was wounded 10 times in the line of duty, the most decorated officer in New York City history when he retired in 1965. He served 20 years in Congress, and he always said one of his proudest, if not the proudest, achievement he ever had was the establishment of the National Law Enforcement Officers Memorial. “He introduced the legislation, became law in 1984. And after seven years of dedicated effort, we opened this monument to the public. It wasn’t easy. It took us two years to pick the specific site it should be built on. Congress didn’t legislate that. So we scoured the city, and we came upon Judiciary Square, where we’re standing here tonight. They say that President George Washington once stood in this very place. He decided that this Judiciary Square would become the seat of our judicial branch of government, the seat of criminal justice in America. It’s one of the three major spaces they designed Washington around. We felt that this was the spot to honor the men and women who enforce the laws of our nation, and keep the peace. On Tuesday night, the Minnesota Wild held their annual law enforcement night to honor and recognize Minnesota Law Enforcement. The Wild battled the Los Angeles Kings in an exciting game where the Wild came out on top in a final score of 6-3. 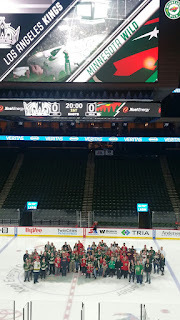 This special night benefited the National Law Enforcement Officers Memorial Fund, and each fan that purchased a discounted ticket through the special offer received a co-branded Minnesota Wild and Memorial Fund rally towel and were treated to a pregame party. Prior to the game, law enforcement friends, family and supporters gathered on the ice for a photo. The next Minnesota Wild law enforcement night will take place in early 2017. For other law enforcement night events with NHL teams across the country visit www.LawMemorial.org/sports. We salute the Minnesota Wild on supporting the thin blue line. Good luck this season!